Surprise someone this Christmas with a once-in-a-lifetime gift experience. Includes one, 7 day anytime (float away on any day of the week: sunrise or sunset) hot air balloon flight voucher beautifully presented with a Christmas helium balloon in a box and a mini festive chocolate cake! Your 3 – 4 Hour Sky High Experience: Greeting, registration and pilot briefing. Invitation to help with the inflation and deflation of the balloon. Around an hours flight in a Virgin balloon (10-16 people). Traditional champagne toast after landing to celebrate your once-in-a-lifetime experience. Certificate signed by your pilot and endorsed by Sir Richard Branson. Retrieval service back to your original launch site. 12 months to book – flying season Mar-Oct (regional variations). Luxury voucher and gift wallet. Please Note: All orders must be received by Monday 21st December for Christmas Delivery. * *Orders placed between 1pm on 24th December – Saturday 2nd January will not be dispatched until Monday 4th January. DELIVERY INFORMATION (Royal Mail, First Class Signed For) - Fulfilment of orders, including Christmas Balloon In A Box will take place between the 17th and 21st December to be delivered before Christmas Day. This is due to the helium balloon having a life-cycle of approximately 14 days. If you would prefer to receive your item/package earlier, please contact customerservice@virginballoonflights.co.uk with your order number. **Our Flying season is March to October. Dates are already available for March and we recommend early booking to avoid disappointment. ***Flight vouchers are non-refundable – if your hot air balloon ride is cancelled due to weather, your voucher validity will be extended by 6 months, so you have plenty of time to find another convenient date to fly. 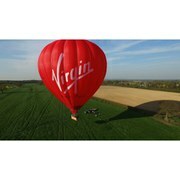 For more Hot Air Balloon Rides, Click Here To view the FULL range of Virgin Hot Air Balloon Rides Click Here.